Eastbrooke Medical Centres warmly welcomes Dr Nataliya Titova to the Eastbrooke Family Clinic Belmont, VIC. 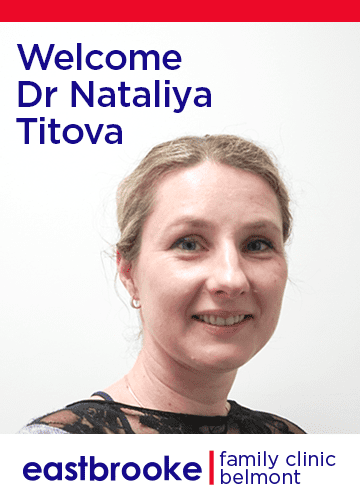 Dr Titova has worked in a diverse range of settings and enjoys all aspects of General Practice. In 2013 she obtained a Diploma in Child Health from The Children’s Hospital, Westmead. Dr Titova has a special interest in children’s and women’s health and is available for bookings now.